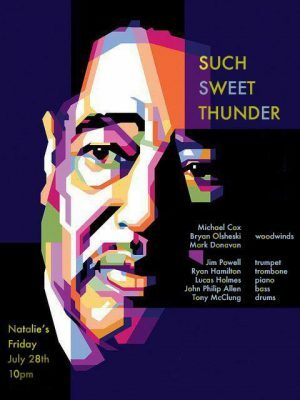 “Such Sweet Thunder: A Tribute to Duke Ellington” (poster art by Lesley Raye) will take place at Natalie’s on Friday, July 28th at 10pm – Tickets are available here. This high level homage to the countless classic jazz tunes composed by Ellington and his musical partner Billy Strayhorn was the brainchild of drummer Tony McClung, who reached out to trombonist Ryan Hamilton for arrangements of this beautiful material and then assembled an all-star cast of Columbus musicians to bring the music to life. McClung was kind enough to answer my questions about an endeavor he’s very excited about – Keep reading to learn more about this special event, including a list of McClung’s favorite Ellington recordings to help you prepare for the show. How did Such Sweet Thunder come together? What inspired you to put on this show? Tony McClung (TM): I’ve wanted to do an Ellington band for ages. It never seemed practical and still doesn’t, but I care more about playing great music and challenging myself than practicality. I’ve known Ryan Hamilton for a long time and he has subbed in Hoodoo. I knew that he is an Ellington fanatic, like myself. I reached out to him a couple of months ago with the idea and he responded instantly saying “You had me at Ellington!” Turns out, he had already been assembling a book of Ellington charts; a couple from when he did a show with Mark Flugge but more that he had collected elsewhere or written himself. Ryan is really why this is possible. I happened to mention to him a list of songs I would like to eventually play and over the course of the next couple of weeks, he knocked out almost all of them, 3 while on vacation with a bad appendix! Charlie Jackson messaged to see if Hoodoo could fill a slot in July when they had a cancellation. Hoodoo wasn’t available but I messaged him and suggested this project which, at that point, was only Ryan and myself. Who are the musicians you have lined up for this performance? Dave Nilo is mixing and he is as important as anybody on stage. He has such great ears and gets the MUSIC. What can you tell us about what you have planned for this evening of music? I also want to note that while we all take part in that and love that too, this is not a typical wide open jazz gig. We have arrangements that are very densely layered music that allow for improvisation on top (and in terms of style) but are beautiful pieces of art that are written down. Duke Ellington is certainly a giant in the world of jazz. Can you tell us about any aspects of his music or career that you think are underappreciated or lesser known? TM: Duke Ellington and his musical partner Billy Strayhorn wrote an astounding number of amazing songs. I’m sure that people who only know “Take The A-Train” and “Satin Doll” Will be astounded by the depth, complexity, and exotic flavors of some of this music. What are some of your favorite Duke Ellington recordings?